"The Lovers is a refreshing, funny look at love, fidelity, and family. The critically acclaimed film features a standout ensemble cast, including Tracy Letts, Aidan Gillen, Melora Walters, Tyler Ross, and Jessica Sula. A husband and wife (Tracy Letts and Debra Winger), each embroiled in a secret, extramarital affair, are sent reeling when they suddenly fall for the least likely person imaginable – one another – in this scalpel-sharp, deliciously grown-up comedy." That is the official description for The Lovers, now available on Blu-ray, DVD and Digital from Lionsgate, which has provided NewTechReview with a NFR copy for review. While the extramarital affairs of married couples is an all too familiar topic for the world of film, The Lovers provides an entertaining look at this theme from the perspective of older adults rather than the more common young couple storyline. Michael (Letts) and Mary (Winger) have been married for many years and they've reached a point in their marriage where daily life is just a routine. They pretend everything is okay, but the love is gone. As I'm sure you can guess, they're both having affairs and they've both told their lovers that the marriage is almost over, but for some reason neither one has been able to go through with the breakup. Then by some twist of fate, the couple shares a sleepy, morning kiss, which leads them to rekindling some of the passion that they both thought was long gone. When the couple is finally pressured by their lovers to choose them or each other, the story takes both an expected as well as unexpected turn. You'll see what I mean when you get to the end. The Lovers Blu-ray presents a MPEG-4 AVC encode with an aspect ratio of 1.84:1. There's not a lot to say about the picture or sound for that matter, since the subject matter doesn't really lend itself to needing vibrant colors or a lot of ambience. The video is clean and clear, although a bit dark in some of the indoor scenes. The audio (a DTS-HD Master Audio 5.1 track) is mostly used for dialogue, which is clean and clear. * The Music of Romance: Scoring The Lovers - a featurette that talks about the music in the film as well as composer Mandy Hoffman. * A Complicated Passion: Making The Lovers - a featurette that provides a look behind-the-scenes and includes some brief interview moments with cast and crew. 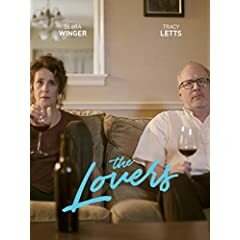 Even though the theme of failing marriages has been covered an inordinate amount of times in the film industry, The Lovers provides a fun look at the topic from the perspective of adults who have been together for many years and who aren't quite sure about what they really want. Some younger viewers may find the movie a bit too slow for their liking, but the older generation will probably enjoy it.